Yep. I already re-did my master bedroom from when you saw it on my Anthropologie inspired quilt tutorial. Like most DIYers, it’s nearly impossible for me to choose just one thing I love. Color schemes, themes, my overall “style”. It’s always changing. I’m never gonna have an absolute favorite anything when it comes to decorating. I just canNOT decide! It’s impossible really. As you can probably guess from my mustard yellow nightstand post, I LOVE mustard yellow and as much as I fight it, I LOVE black and white together. It’s just so classic! I keep telling myself I’m over it, but that’s a lie. I’m not. Probably never will be. The overall inspiration came from a couple of bedrooms on my pinterest board but Brooke’s from All Things Thrifty in particular. I just LOVE her room! Gooooorgeousss people! I love her fabric headboard but I’m in love with my carved ornate one that I scored for $9.95 so I was determined to make it work. yep… didn’t even vacuum my floors. Sorry folks, just keepin it real. lol! 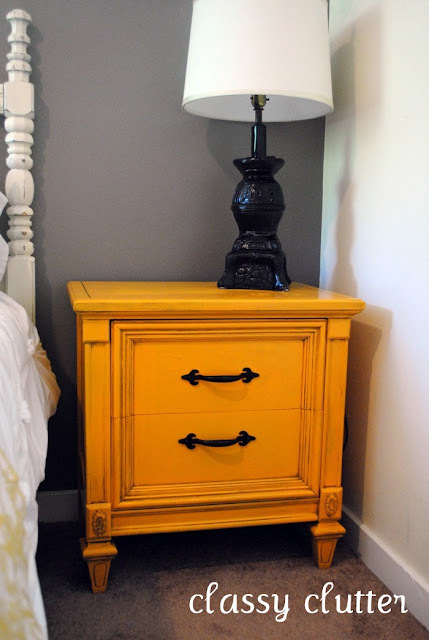 Mustard yellow nightstand makeover here. Thank you Brooke from All Things Thrifty for the inspiration! Chandelier was a birthday gift from Savannah two years ago 🙂 Love u Savy! My CARDBOARD, yes cardboard, starburst mirror!!! I got the tutorial here! It cost me $4 to make it and I’m in love! I made it out of cereal boxes! These curtains took me under an hour to make and only cost me $4 in fabric! I had the white so I just bought 2 yards of black. SO easy and SO fun! I’m loving wide stripped curtains right now! If anyone wants a tutorial, let me know. It’s super dee duper easy people! I made all of these pillows. and I love them lots! I want some more! 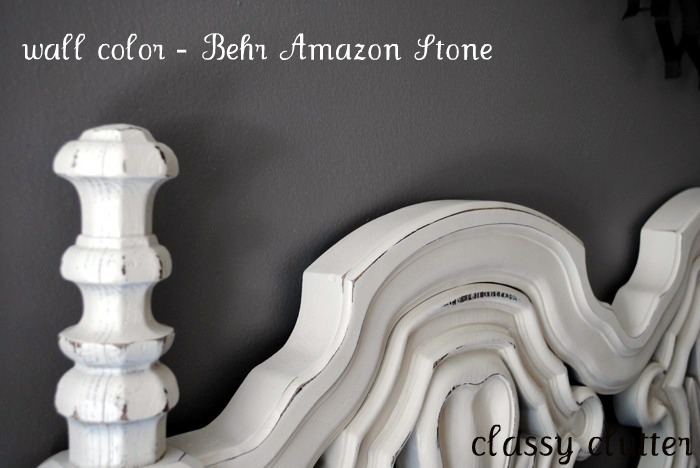 So, this was a Glidden color match but I’m 90% sure that I used Behr’s Amazon Stone. If not, it is insanely close 🙂 I’m a renter so I’ll have to paint this accent wall back when we move out. That’s the beauty of painting one wall. It only took me an hour and I may or may not have done the whole thing with a trim roller – bah! The black and zebra dresser is done! See it here! Capiz Shell Chandelier post here! So what do you think my friends?!? Do you like the new look?? Oh my this looks amazing! Your pillow are incredible! INCREDIBLE!!! Thanks for your inspiration! I am a sucker to for black and white but I love duck egg blue as my contrast! Wow!!! This looks incredible — so sophisticated yet fresh and fun. Great job! I love the yellow night stand. I love your room, it looks so nice and calm and the colors are just great! Where did you get the yellow cover at the end of your bed? I have to say I clicked on your tab on the Tatertots and Jello Weekend Wrap Up because of that mirror. I’m amazed it’s made out of cereal boxes. I’ve seen the tutorials before, but you definitley tricked me. Amazing job, and your room looks gorgeous. Thanks for the good ideas. I love it! Such a different style than before! The pillows are awesome and I adore that night stand! 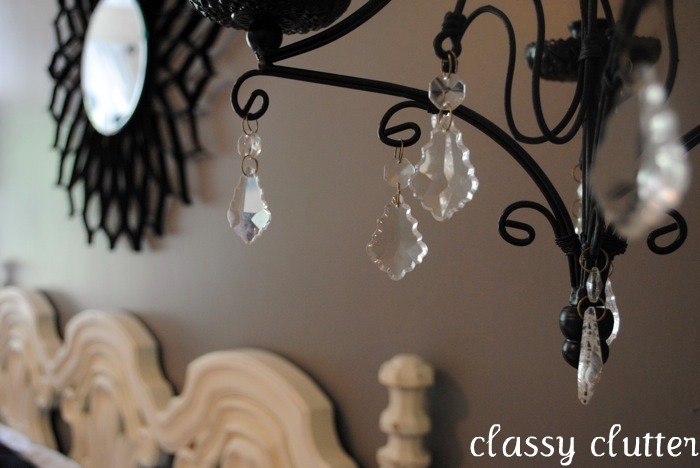 Mallory – Your room looks simply fabulous! Loving the colors you used. 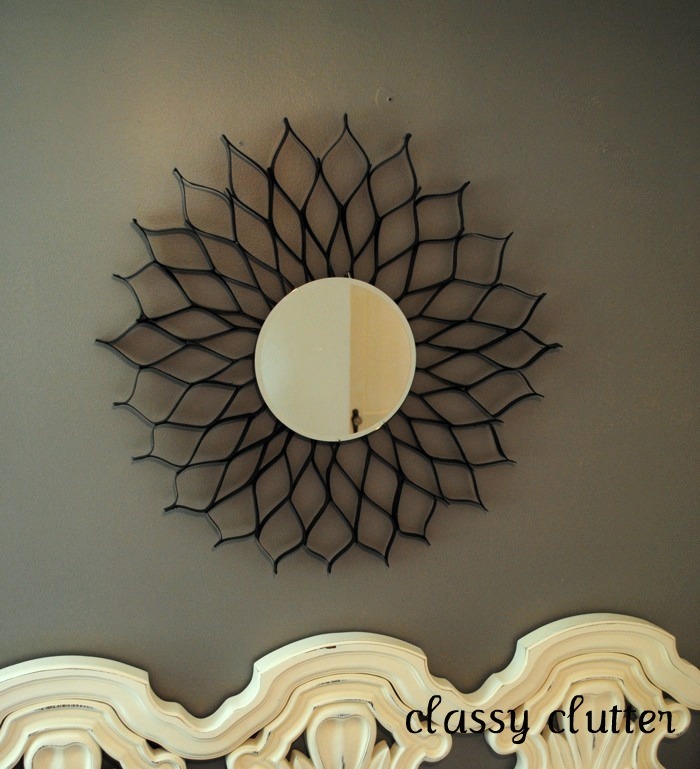 Thanks so much for including the link to the mirror – yours looks gorgeous! Your room is looking lovely! The headboard is to die for…absolutely to die for. Oh, and I love all the pillows. Total cuteness! Darling – love your new room & all the tutorials! Your master bedroom is beautiful! I am the same way – I am always changing up my rooms. I would love to add this to my paint color galleries and include you in a feature post. You wouldn’t have to do anything, just let me know if you’re interested! Love the colors you used and the way you incorporated them into the room. 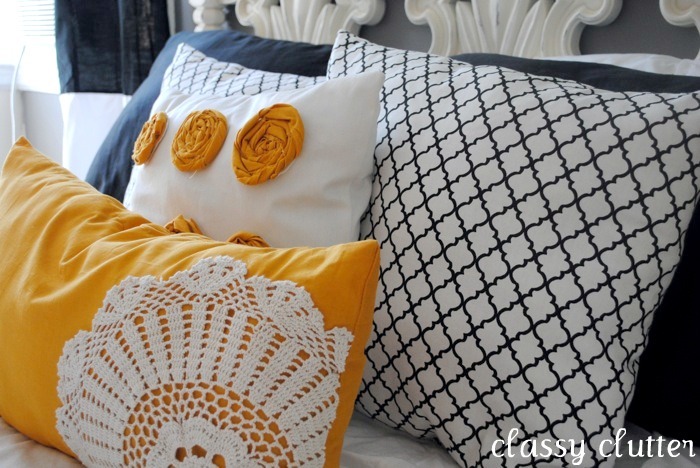 Love the pillow with the doily! Great idea! This room turned out great! I love the mix of pillows on your bed! Something about yellow in the bedroom is just so upbeat and sunny. I really love the pillows! The whole room is great! 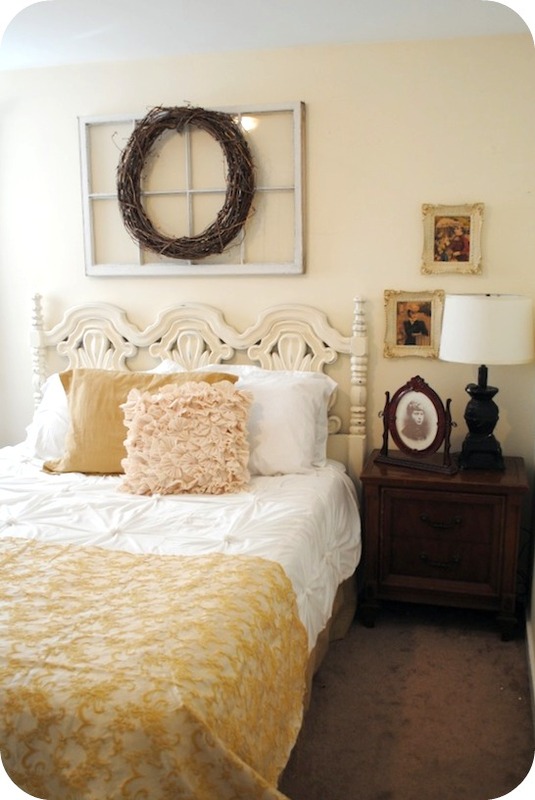 Its great inspiration for my in progress master bedroom re-do! I love mustard yellow myself. This is gorgeous! Great job! I trying to get up the nerve to paint my nightstands. I looove the curtains! Can you please do a tutorial for me:)Thanks! This room looks amazing!! love it both ways!! 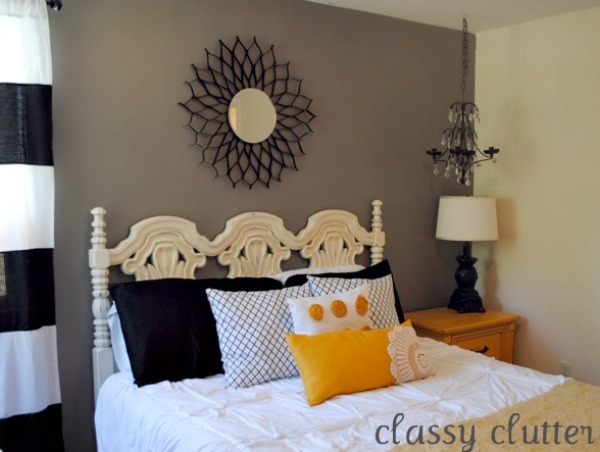 I love the dark gray wall color and all your beautiful accent pillows. Lovely room! I really love all the colours that you incorporated into your bedroom. 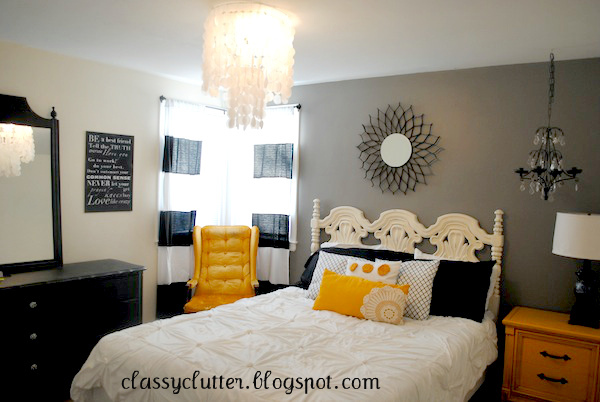 I am dying over that headboard and your yellow chair! The whole thing is awesome. I do however, also covet your blanket on the end of the bed in your before picture…. off to pin! Beautiful! Nice job! I love all the details. And I totally have to check out your tutorial for the sunburst mirror! ummm… this room could not be more fabulous!! I too am obsessed with mustard yellow. 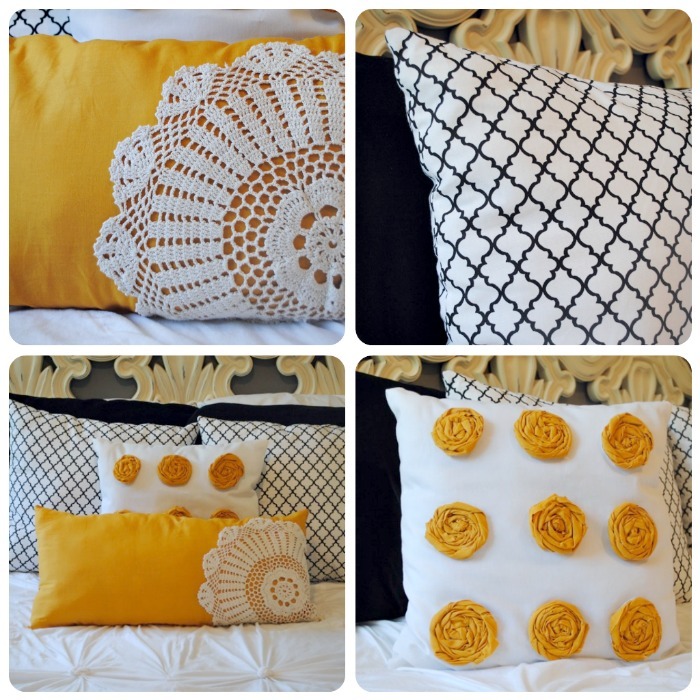 I absolutely LOVE the pillows – in particular I’m loving the mustard yellow with the doile (is it a doile?). Beautiful, truly beautiful! I love black, white and yellow together! Love the room! I have similar corner windows and can’t figure out how to do curtain rods. Do you have a corner piece/bracket? or did you hang two separate curtain rods? Do you have finials in the corner? I can’t really tell from your pictures – but I would love to know how you handled the skinny corner windows. Thanks! This room is gorgeous and I would love to know how you did the curtains! My biggest question however is if they are washable?? I have been dying to paint me some striped curtains but am afraid to and then not be able to clean them, or have them be super stiff and crunchy! Any tips are appreciated!! Thanks! YES! They’re washable. 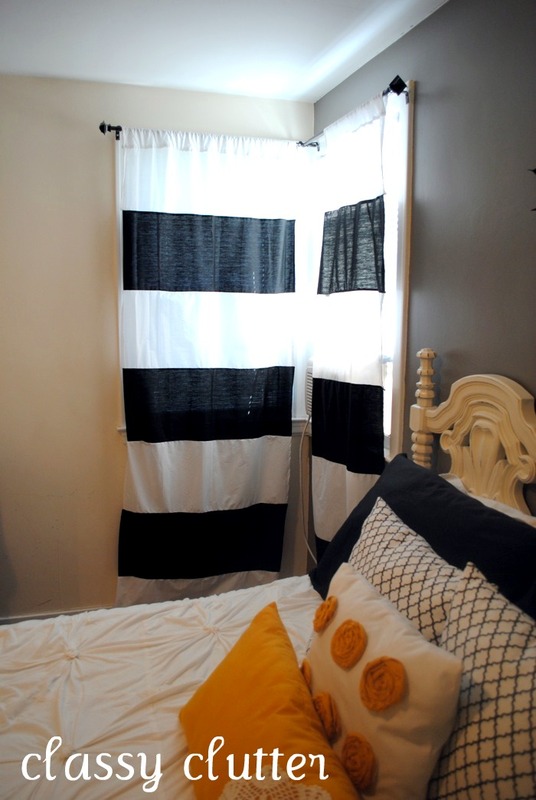 I made them by sewing strips of white and black cotton sheets together to create the stripe look!